This paper presents a systematic analysis of the similarities and differences between the fields of open innovation and open strategy. In particular, we examine the concept of openness from a communication-centered perspective and compare processes of open innovation and open strategy with regard to the openness they exhibit. By distinguishing between openness in terms of sociality, factuality and temporality, we find that cases of open strategy tend to exhibit lower degrees of openness in the social dimension and higher degrees in the other two when compared to open innovation. 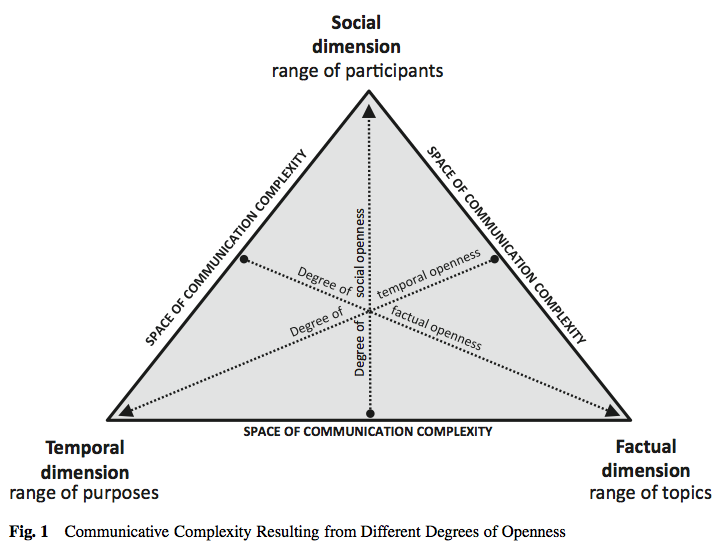 Notwithstanding variation within and between the fields of open innovation and open strategy, opening up in one dimension of communication will generally result in pressures to decrease openness with regards to the other dimensions – unless particular tools are employed that help cope with the additional degrees of communicative complexity.